Perhaps you can view “Little Women” by John Ravold and Louisa May Alcott as one long homily. One very entertaining, enriching homily. The play is being presented at SummerStage through June 24. Its deeply moral tone and the family values presented place it squarely in another century, when such things seemed to be held more dearly. And it is these traits which make the play so refreshing today and a wonderful choice for SummerStage’s family friendly venue. Alcott’s story is a familiar one, centering on the March family, which consists of four girls on the cusp of womanhood and their parents, during the Civil War. Though a location is never given, it is believed Alcott’s story is set in New England, where she lived. Among the Alcott family friends were Henry David Thoreau and Ralph Waldo Emerson, the latter of whom is mentioned in the play as being a visitor to the March home. The four girls -- Jo (Jordyn Stewart), Meg (Carly Sauer), Amy (Michelle White) and Beth (Alyssa Ratkowski) -- all have very distinct personalities. Jo is the tomboy who “doesn’t want to look prim” and wants to be a writer. Meg is the oldest and, perhaps, wisest. Amy loves to draw, but is self-centered and jealous, while Beth is gentle and sweet, but sickly, a stark contrast from her high-spirited sisters. They are all at an age when young men are beginning to notice them, and in this condensed version of the Alcott book there are several that vie for the attention of the girls. The four girls are like kites in the wind that the girls’ mother, called Marmee (thought to be a combination of her name – Margaret – and “Mommy”), keeps from flying too high or getting out of control with their teenaged dramas. Her homespun advice represents good lessons today, such as when she talks about how, even without a lot of money, her family makes her feel rich. She tells the girls not to be idle and that “work is a blessing.” She speaks lovingly of her husband, whose service as a chaplain during the Civil War landed him in the hospital. “Whatever happens, it is God’s will and for the best.” She sprinkles her wisdom freely, always trying to put the girls on a path to happiness and goodness. “When you feel discontented, think over your blessings and be grateful,” she says. 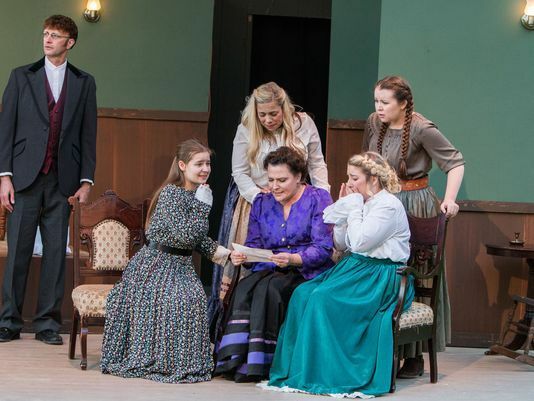 These five characters are the heart of the show, and the heart beats strong in this SummerStage production with the marvelous, emotion-packed performances. In Act I, we learn all about the girls and the two young men who are frequent visitors – John Brooke (Dean Drews) and Laurie (Zachary Klahn) – a shortening of his last name, Laurence. The two create some interesting dynamics among the girls. This is especially evident in Act II, when Jo sees Meg and John becoming an item and Jo just can’t cope with the close-knit sisterly quartet being separated. “I wish I could marry Meg myself and keep her safe in the family,” says Jo. She confides in Marmee her confused thoughts. “I hate to see things going all criss-cross and getting snarled up.” It is a marvelous scene as performed by Stewart and Gehl. In Act III, nearly four years after the play opens, the girls are grown up and have settled into adulthood. It is Marmee’s birthday and the wonderful, hope-filled celebration is most satisfying. Under the direction of Diane Powell, the cast gives a faithful rendition of Alcott’s beloved story. These are not easy roles, especially for the four sisters who must navigate Alcott’s 19th century language – which sometimes sounds stilted and formal in 2017 – with lengthy dialogue. As Jo, Stewart is everything you’d expect. She is most comfortable with her spunky character, in words and actions, giving her a genuine quality. She speaks her mind with conviction and enthusiasm. The other sisters, too, are well-cast. Sauer’s Meg is another strong figure, but has doubts about herself. I really enjoyed the scene in which she stands up to haughty Aunt March (Teresa Drews), who tries to keep Meg from marrying John Brooke – Laurie’s tutor -- because he is not a man of means by threatening that Meg will be cut off from her largesse if she does become Mrs. Brooke. Meg choses love over money. White as Amy, who is called “too particular and prim” by her sister, plays up her character’s femininity and concern about her appearance. Ratkowski’s Beth has a peaceful, quiet demeanor, making her recede into the background when her boisterous siblings are around. There is a wonderful maternal quality about Gehl as she plays Marmee. She is steady and warm, yet there is a firmness and fairness about her that commands respect and devotion from her family. Marmee and Meg share such a tender moment when Meg seeks her advice on her marriage. Klahn as Laurie has just enough swagger to make his character appealing and interesting. He really engages the audience and fits into the March clan like a family heirloom. Though playing a not well-developed character, Doug Smedbron captures the father’s kindly nature effectively. When he returns from the hospital, the girls gather around him like butterflies vying for the same flower as he describes each one’s attributes that he so loves. Dean Drews as John Brooke, the awkward teacher, presents a suitably shy character while Teresa Drews’ Aunt March commands attention when her outspoken character is on stage. In the final scene, Jim Mallmann as Professor Bhaer is introduced to the family when she accompanies Jo from New York. Mallmann’s is a nicely done characterization, his awkwardness and tenderness most endearing. Christopher Kurtz’s set and Stacey Gresbach’s costuming, both fitting for the times, combined with good, audible sound from all characters make this tale of family devotion a good choice for a summer evening of classic entertainment. Period music before the show and during intermission is a nice touch.